Hartnell MESA students hosted a special guest this week to show off their transfer success. 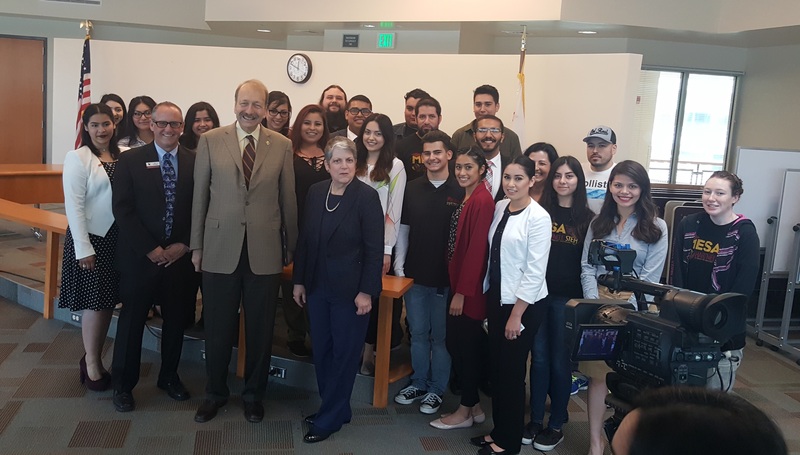 University of California President Janet Napolitano met with more than 30 MESA students and other Hartnell UC-bound students Thursday. Streamlining the transfer process and increasing the number of community college students who transfer to UC campuses is one of Napolitano’s key initiatives. MESA has been helping educationally disadvantaged students successfully transfer to four year institutions for more than 30 years. In addition to Hartnell, MESA has centers at 35 other community colleges that serve a total of 4,700 students throughout California. Top campuses MESA students transferred to were UC Davis, UC Berkeley, Cal Poly San Luis Obispo and UC Santa Cruz. * And 97 percent of MESA community college students transfer as STEM majors.